Giant dairy co-operative Fonterra's announced an 11% fall in after-tax profits to $745 million for the year to July 31 and has trimmed the final farmers' milk price payout to $6.12 per kilogramme of milk solids. With the previously announced dividend of 40c this gives a cash payout of $6.52 for the year. Fonterra makes no mention in its main announcement to NZX why the final milk price has been reduced from the last signalled price of $6.15. The reduction in profit of the co-op was to be expected as, somewhat contradictorily, Fonterra's cost of goods increases if the milk price rises - as it has in the past year. 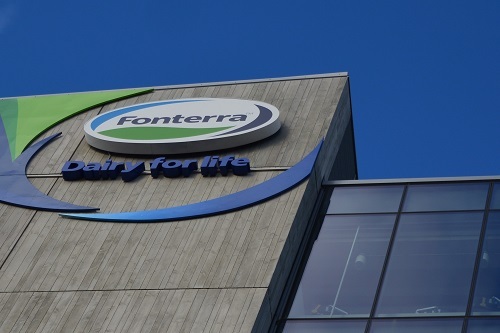 Fonterra maintained its forecast for the current year of a milk price of $6.75 per kgMS with a forecast earnings per share range of 45-55 cents per share. The 45-55c per share eps figure is the same as in the past year, which produced a 40c dividend. So, this would suggest a current target of a cash payout of $7.15 in the current year. ASB senior rural economist Nathan Penny said: "Fonterra continues to make financial par, but no more than that." He said it was not surprising that the lift in the milk price over 2016/17 put the squeeze on profits. "Interestingly, Fonterra anticipates making a similar profit this season despite the likely further improvement (of around 60 cents) in the milk price. In our view, delivering on this expectation would represent material financial performance progress for Fonterra. However, time will tell on that front. "On the farmgate milk price side, we are more confident - we continue to forecast a 2016/17 milk price of $6.75/kg. Although as we have stated recently, if the weather and NZ production don’t improve, we expect to lift our milk price forecast to $7.00/kg or above in the next month or so." Chairman John Wilson said Fonterra was "well positioned to deliver higher volumes and new product formats in our Consumer, Foodservice, and Advanced Ingredients portfolios, and are confident in our forecast earnings per share range of 45-55 cents”. As stated there, revenue increased by 12% to $19.2 billion, with rising prices offsetting a 3% decline in volumes at 22.9 billion LME. Normalised EBIT of $1.2 billion was down 15% as a result of reduced margins across the business which also influenced net profit after tax, down 11% at $745 million. Wilson said Fonterra's ability to maintain its forecast dividend despite the Milk Price increasing by 57% over the year and the impact of negative stream returns "was an excellent result". The CEO aptly rewarded for the outstanding results? A well deserved reward no doubt. At the end of the day it's mostly farmers, shareholders and the chinese being taken for a ride by executives and senior managers so why would I be bothered? What would he have been paid if the profits had increased? Saw tweet from Theo today. "Volume is down, and inventory is lowest ever. But we're still up by milk price of 57%"
Isn't that Supply and demand 101? So why the heck is Volume one of Fonterra's three Vs.
"New Zealand dairy giant Fonterra has confirmed it has lodged a bid for Australian co-operative Murray Goulburn, while revealing it was poised to overtake its rival to become this country's biggest buyer of milk." Cost to conned-sumer is up too...so must be ok.
Perhaps Theo could donate his excesses for the good of man-kind....so they can get a free milk, now and again....not being Milked...always..eh. Plus the Farmers could donate a packet of dried milk....so they can have some in the pantry, when we get some clean water .....Naturally. Irony is in the eye of the Beholder. Kick Start breakfast programme has served more than 14million breakfasts since it started. It is a partnership between Fonterra, Sanitarium and The Ministry of Social Development and is available to all schools. Fonterra provides milk to more than 170,000 Primary school children every day. I think you will find it is the Consumer who pays for all that...plus any and all wages, fees, debt, spoiled waterways,I could go on but the list is endless. When all expense taken into account, Profit is down. So prices go up... to pad out the suckers debts....which you as a consumer must bear. OK if not poor. Nothing is free in this strange world of ours. But also no accounting...for taste. So what business doesn't the consumer/client pay for business costs you mentioned? You don't have to buy Anchor branded milk - there are cheaper alternatives. We only have one large supermarket in our town and it refuses to stock Anchor milk as the town is mainly families and they buy on price, so that counts Anchor milk out for the supermarket owners. Yet Anchor Butter is cheaper by up to around $1.50/500gms at out local BP station, so why would you pay more at the supermarket - it is a choice to do so. Sanitarium is not a good example to choose - all taxpayers subsidise their endeavours. A 250ha farm near Kaiwaka is the latest Northland property to be sold to overseas interests, according to the Overseas Investment Office. The sale was approved on July 4 but the decision has just been released. At this rate how long before the majority of NZ land is owned by foreign interests? Is this how "strong and stable' government works? Looks like the relentless war on farmers is having the desired affect then. What powers does the OIO have if they haven't, can they force resale?